There’s been some talk lately about how comic stores have been “historically” unwelcoming of women. Normally I would post the tweet of a person who said this, but whenever I do that sort of thing, I get a few of their friends yelling at me that I’m “being mean” for continuing a dialogue that was started in a public forum, and I don’t want people yelling at me today, so whatever. In any case, the idea that “women are made uncomfortable in comic stores” is something of an old chestnut in the realm of geek-shaming, so it really doesn’t matter who happened to say it today. So here’s one story of what happened when one woman, or young girl in this case, went into a comic book store for the first time, just for posterity. I was 11 years old, and I was obsessed with X-Men. The Saturday Morning cartoon wasn’t enough to sate my mutant cravings, so I decided it was time to seek out these strange things I’d heard of called “comic books.” I think I had been dimly aware that comics existed for a while, but it wasn’t until X-Men that I suddenly felt a need to know more. My mom went with me to a comic book/toy store in a local shopping center. Standing behind the counter was a petite, 30-something brunette lady with a friendly smile; thinking back, she probably looked close to the way I do now, only I doubt my smile is as warm. A little nervous, I asked if they had any X-Men comics, and she cheerfully recommended several titles to me, and answered some of my questions, which I don’t remember, but I know I had some. My mom, never one to miss an opportunity to make things awkward, asked “Is it unusual for a girl to like comics?” The lady laughed and said that some of the store’s regular customers were women who worked at Grumman nearby (this was before they merged with Northrup and became Northrup Grumman– hahahah DATING MYSELF HERE), and women reading comics was not uncommon anymore, if it ever was. 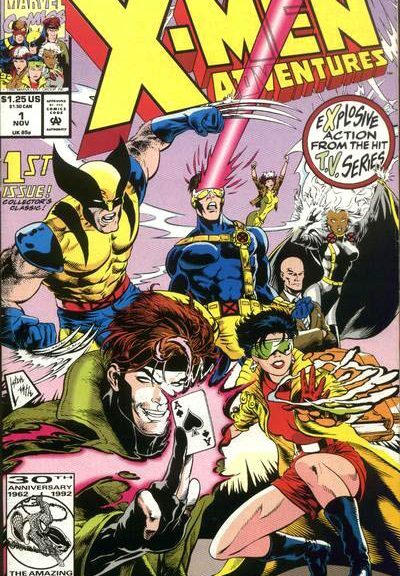 My Mom was mollified, I walked out with some issues of X-Men Adventures, and everyone was happy. The brunette woman who had been there that day co-owned the shop with her husband, and on return visits, it was usually the husband that was there. The sight of him didn’t fill me with the same warm-and-friendly feeling that his wife did, but he was still perfectly nice and was happy to answer any of my questions about comics. So began a period where, on Saturdays, my Mom would drop a friend and I off at the shopping center, with $10 to pay for lunch. If I had any money left after lunch, I went and bought comics. Amusingly, I thought I was supposed to give the change from lunch back to my Mom, so I used to hide my comics in my room like they were stolen booty. I only found out later that my Mom didn’t actually care that I was spending maybe $4 a week on comics, which was an amazing relief at the time. I was entranced. 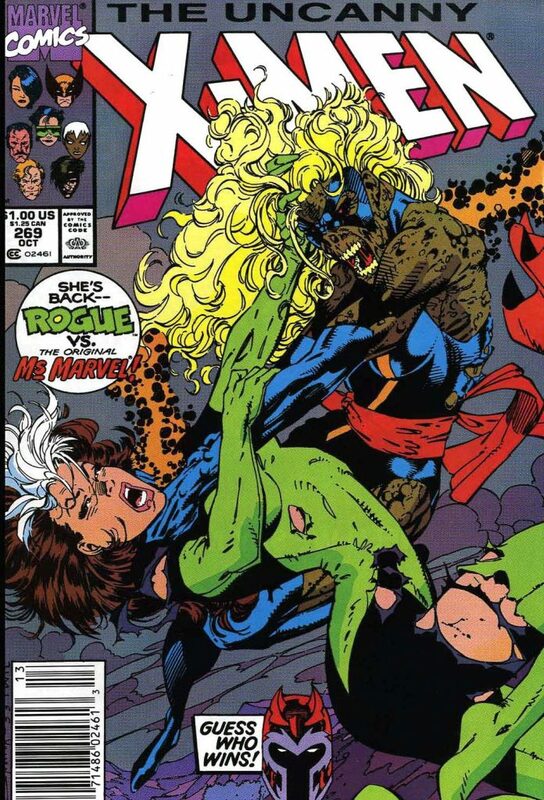 My favorite character, Rogue, fighting some kind of terrifying zombie creature? OMG so cool! I kept looking for stories about Rogue, and I always seemed to end up with issues about Jubilee finding herself, or some crap. I wanted to find out how Rogue was going to get out of this jam so badly, and the fact that the cover art was kind of scary and grizzly only made it more appealing; it felt like reading this comic would be an initiation into a fascinating, dangerous adult world. Sadly, the back issue was marked up to $8, which put it out of my price range. I remember begging my Mom to let me buy it, who said something like “Wait until you’re making $20 bucks a weekend babysitting, then you can buy expensive comics.” Fortunately, I didn’t have to wait that long– I don’t remember exactly, but I think I scrounged up some birthday money or something to buy Uncanny X-Men #269. I think the issue had been marked up too high (even during the speculator boom), but I will say that I got my money’s worth out of it; I copied practically every Jim Lee illustration in the entire comic. When I expressed interest in drawing comics, the guy at the store special-ordered How to Draw Comics The Marvel Way for me, which I devoured. I never really did learn to draw comics The Marvel Way, but I did learn how much I loved drawing. Unfortunately, this was during the ’90s speculator boom, and barely a year after I’d first started buying comics, the crash came. A huge number of comic stores closed, including my store. I went on to frequent other stores over the years, all staffed by guys who were always encouraging my interest in comics without crossing the line into being patronizing…which, looking back on it now, is a pretty difficult balance to hold. I’m amazed I happened to luck into several people who could do that. I’ve drifted in and out of buying American comics since then, largely because I lost interest in X-Men and other titles I used to love (which is a topic for another day.) Lately though, I’ve started reading some comics again, and my local store is pretty cool. They have a big kids section, and I’ve gotten some children’s books for my daughter there, as well as gifts for other people’s kids. Plus, the owner is a family man, so he’s understanding on those occasions when I’ve had to come into the store toting a stroller with a cranky toddler. Sometimes his kids hang out in the store, reading My Little Pony and generally being adorable. So…yeah. If comic stores have “historically” been hostile to women, this was a period in history I never experienced. I’m not saying it never happened, and there aren’t women who had legitimately bad experiences. The Simpson’s Comic Book Guy may be a stereotype, but it was inspired by something; some people like that surely exist. I’m not trying to invalidate anyone else’s experience. What I am saying, is this: please don’t erase me from comics history. Please don’t pretend like all girls and women faced animosity when entering so-called “geek spaces”, when it’s simply not true. It’s unfair to the genuinely nice men and women who ran most of the stores I frequented, and it’s unfair to me as an individual. If I say “I’ve always had a good time in comic stores,” because it happens to be true, I shouldn’t be accused of lying, or other nefarious intent. Is my comic store story any more important than anyone else’s? No. But it isn’t any less important, either.